The most powerful Love Potion in the Harry Potter world, Amortentia causes powerful infatuation or obsession in the drinker. It manifests as a different aroma to each who drinks it, recalling one’s favorite person, place or thing. 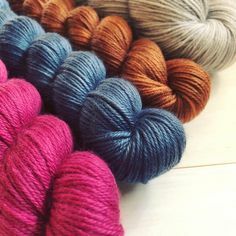 Indulge your own deep love by knitting your Amortentia shawl with a favorite color or irresistible yarn. This shawl is cast on with many stitches at the ruffled edge, which is knit with optional beads for extra sparkle and weight. 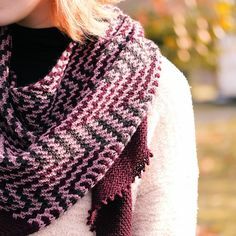 By the end of the ruffle, the number of stitches is reduced by 2/3, then like the twists and turns of love, the edging and body are divided by a garter ridge, and the stitch pattern reverses itself into a wide rib. The long and narrow body is knit with short rows to the top edge, and finished with simple garter stitch. Instructions for two sizes are given, and differ only in the frequency of the short rows. Irresistible looking from both sides, Amortentia is meant to be the embodiment of everything you love. Techniques & Skills Used: long-tail CO, knit/purl, beading (optional; prestrung and crochet hook methods, with link to tutorial), decreasing, short rows. Size: S (L); approximately 62” wingspan and 9 (16)” depth. Yarn: Malabrigo Yarn Silky Merino (51% silk, 49% merino; 150 yards/50g): 2 (3) skeins; S shown in Unknown Lavender, and L shown in Amoroso. The Silky Merino grows substantially when blocked, and makes a very drapey luxe shawl. For a similar result, choose a single ply yarn with significant silk or other non-springy fiber content. Other Materials: US 7 (4.5mm) 32” circular needle, or size to match gauge; Stitch markers (2); Size 6/0 seed beads (350), optional; 1.25mm crochet hook for placing beads; Yarn needle. Gauge: 16 st and 28 rows/4″ in K3P1 Rib, after blocking.